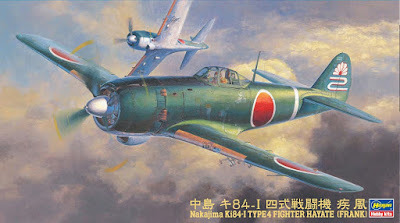 In Richard M. Bueschel's series on Japanese WWII fighters (i.e, "Nakajima Ki-84 Hayate in Japanese Army Air Force Service) and Rene Francillon's "Japanese Aircraft of the Pacific War"), the authors repeatedly mention that the latter-day Japanese fighters, while technically equal to their Allied counterparts, were plagued by variable and poor workmanship; Bueschel writes that the Ki-84 could only rarely achieve a level speed of 400 km per hour. For example, the level speed of the Nakajima Ki-84 fighter was rated at 620 km per hour, yet reportedly most late-production specimens could not achieve even 400 km per hour due to poor workmanship of the airframe and engine. As for the Ki-84, I remember talking to a P-51 pilot from SWPA. He said that sometimes they would try to intercept the Franks, which could and did show them a clean set of heals. If this was an overall problem I think this "legging it" would not have happened. A good question would be where did this information come from. Was it from the US, who did and still do put down aircraft that were either superior or at least on par with their own, or was this actual Japanese records showing this. I apologize to our American Friends out there, the above comment is not an attack on you guys but just something that I have seen and heard over the years, by various Authors and Vets. I recall reading accounts of trials of captured Japanese aircraft, in particular the Ki-84, which stated that the fitting of US spark plugs made a vast difference to the aircraft's performance. The fitting of US brake pads too, where possible was found to be a must too! Material shortages and quality problems in seemingly minor areas can have a dramatic effect on overall performance. Were the late war Luftwaffe fighters subject to similar inconsistencies in workmanship and quality control? Its an accepted fact that workmanship on the production Me-262s could vary by a huge margin. With components from several sources and locations, it was impossible to get the same kind of tight tolerances that a single factory of that period could produce. There were reports of some Me-262s that were discovered to have foreign objects (tools, supplies, etc.) pushed into void spaces by their builders, no doubt in response to their slavery. Also, I read here once that a Junkers 290 crashed and it was later determined that the tail section was delivered with a very large amount of very heavy tools hidden in the tail. The Swiss thought the 109Gs they received were terrible, as opposed to the few Fs that they received mid-war. The French thought the same about the Fw.190s they tried to operate postwar. This was partly due to wartime pressures, and partly to the influence of all the foreign (slave, if you like) workers employed in the German industry late war. It should be added that late P-40s were much cruder than the early-war aircraft, though this is due to an intense "simplify and add more lightness" campaign rather than a decline in workmanship as such.